I've been avoiding Marathon Man like the plague for two reasons. For one it combined two things I don't enjoy; running and the dentist. 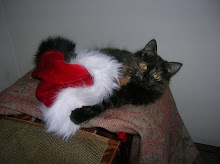 And two, because I knew it was over my limit in terms of length. 2 Hours? Pssssh I don't have the time for movies longer than an hour and 30 minutes. OK fine I kid. I was actually avoiding it, because I knew that there would only be one main scene of importance when talking about scary moments. And being the good movie watching pup that I am I knew I had to watch the whole thing or people may think I was....a...a....loser! 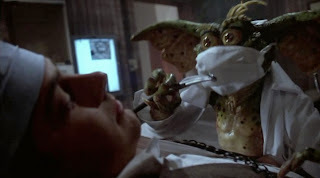 I will also admit however that I was excited to see that particular scene because of Gremlins 2. As a child who had a strange fascination with Gremlins 2 but not Gremlins, I always knew that the "Is it safe?" dentist Gremlin carried a deeper meaning with it. My father found the scene to be particularly funny and when I asked him what it was in regards to, he always said something about some crazy dentist. 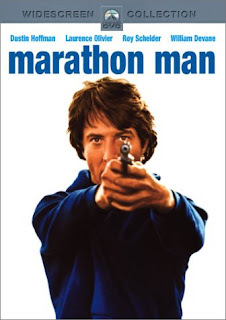 Hence- an interest in Marathon Man but not an entire interest in the movie. 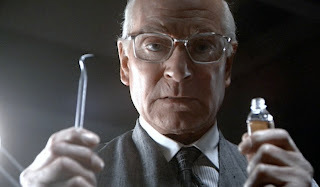 And yes I realize Marathon Man is a good movie yadda yadda yadda--well it put me to sleep, sue me. Here are some quick thoughts on the matter. First off why does Dustin Hoffman have to be so goofy looking? I asked this question on Twitter last night and the answers were half and half. Are we suppose to find him attractive? It was never made clear to me. He's got that big schnoz and that Charlie Brown head, he seems short--I mean what exactly is the appeal? He kind of annoyed me in this and there even a few moments of bad acting on his part. Hoffman--what is the deal??! Oh right--I forgot about the plot. Well it's a little confusing. Basically it involves, double agents, government agents, Dustin Hoffman running, Dustin Hoffman running in pajama pants on the Brooklyn Bridge, a crazy Nazi dentist, some diamonds, and some Jewish people. 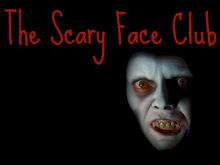 There ARE more than just one creepy scenes in this. 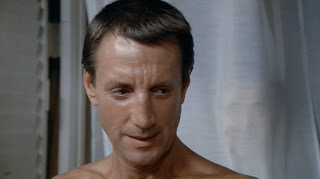 One that really stuck out to me was when Roy Scheider is on his balcony and that scary guy with the two colored eyes breaks into his apartment and just watches him from behind that thin curtain. Holy crap. Isn't that scary? He looks like some crazy possessed doll- and you can just barely see him. Personally this scene freaked me out a bit more than the big dentist appointment. But then again I do have an irrational fear of creepy Asian men with two different colored eyes hiding behind curtains when I'm on a balcony watching a bicycle race. Can you really blame me? I did quite enjoy a number of scenes that may not have been scary, but just well-awesome. The one that stands out the most however is the scene where Szell goes to get his diamonds appraised and SPOILER ends up slicing that guys throat with his crazy wrist knife. That was most definitely one of the most ballsy things I've ever seen. Also that knife rocks. Now onto this scary moment. It's a pretty basic fact that no one really likes the dentist. Since I had bad teeth for most of my life- I can relate. 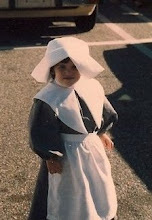 I once had 10 cavities when I was 6 years old...too many sweets! I remember little about the experience except that I cried a lot and that my mom told if I didn't cry at the 2nd session she would buy me a toy. Oh the little things in life. 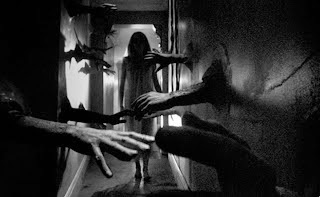 Anyways--this scene is quite chilling and is also handled very well. It's not over the top, it's really just a subtle chilling scene. Seeing Svell with his dental equipment and the way he keeps repeating "Is it safe" is just....gah. I actually loved Dustin Hoffman's interaction with him at that point, kind of funny while at the same time, terrifying. And then the drill noise, the sharp thingy they poke your gums with being shoved into his cavity- egad. Imagine going to your dentist and finding Svell there instead? Yikes. But honestly, what's with him not wearing gloves? Gross.